The subtle act of mote extraction, Nagrand Edition. Having told you about what I do before I go and farm, it’s time to see the process in action. The skinners have been spending most of their time (on both sides of the Faction divide) in Dire Maul, and I’ll be telling you why it’s such a great place to farm over the weekend. For my miners, there’s a great deal of action currently in Nagrand. There are a phenomenal number of people levelling a trade right now. More importantly, as information slowly leaks regarding what changes we can expect to professions in Cataclysm, there’s a lot of new Engineers on the block. G my BM Hunter has been an Engineer since just after TBC hit, and as he demonstrates so ably above perhaps the most useful gadget he’s made in his time is the wonderfully-titled Zapthrottle Mote Extractor. Forget portable mailboxes and Personal Repair Robots, this is the one thing I’d never ever be without on my travels. It’s a veritable licence to smelt gold. Nagrand was, back in the day, a cutthroat place to farm. Fel Iron and Adamantite, plus the random chance of Khorium were nothing compared with the boundless wealth to be had from the Windy Clouds only engineers could ‘mine’. 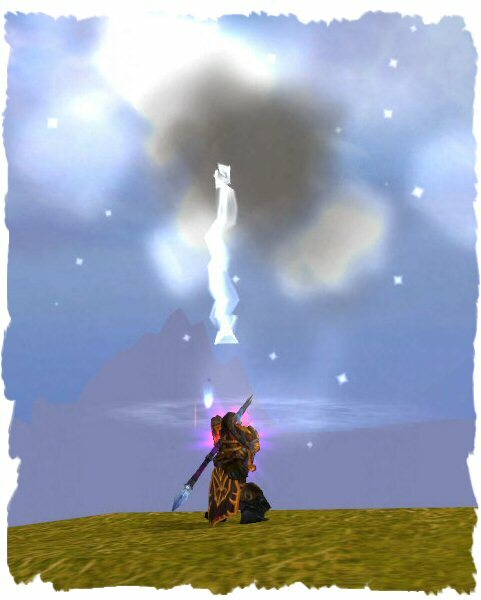 Primal Air was a staple for levelling Leatherworkers, Miners, Engineers… I spent a great deal of time there. When I was looking at possible raw materials to farm I was initially reticent to return, until I saw the prices of Adamantite and Primal Air, which are now higher on my server than they were back when these items were essentials for crafting. The weekend may be an awful time to farm but it’s an excellent time to get your items on the AH (I can normally make 10-15% more on items than I can during the week) so this morning I set out for sixty minutes of concerted effort. No dot was safe. When I finished, I was pleasantly surprised at my haul. I was also able to mine enough clouds to make up six Primal Air. The two Fel Iron bars came out of the occasional chests that are dotted across Outland (Dwarven racial Find Treasure ftw!) and I even managed to pick up a couple of decent greens from Ogre casualties. What struck me immediately from farming was just how few people were doing the same: having started early there were myself and only two other Alliance levellers in the Zone, and I saw only one Horde player in the entire time of my labours. When I got the spoils to the AH, Adamantite was listed for 40g a stack, Fel Iron 30g and the Primal Air a massive 70g each. The Khorium was 50g for two pieces ^^ I’m not a greedy person, and I think my pricing was more realistic, which will mean I will earn 500g for 60 minutes work. That seems more than reasonable. ← Goldz iz Srs Bsns! :: 5 Rules To Maximise Farming.